Half-hardy, erect, almost unbranched, fast-growing annual or short-lived perennial with palm-like, 3- to7-lobed leaves, to 15cm long, and single or few-flowered axillary racemes of funnel-shaped, pale yellow or purple-red flowers with crimson-red centres, from summer to autumn. To 3.5m. The variety Lindleyi has deep purple flowers. [RHSE, Hortus]. Figured in Curtis’s Botanical Magazine as Hibiscus radiatus. ‘Hibiscus radiatus was raised in the garden, at Madrid, by Professor Cavanilles, from seeds sent him by Sir Joseph Banks. It differs from cannabinus, with which it has been confounded, in being shrubby, not an annual; in its leaves being more deeply divided into five segments, and wanting the gland at the base of the midrib; in having the outer calyx the length of the inner, ten-rayed, more spreading, and the inner calyx without glands. It has the same acid taste as cannabinus. Like surattensis (1356) each segment of the outer calyx is furnished with a little appendix near the tip, but not nearly so remarkable as in that, and indeed sometimes scarcely visible, and often not at all in the dried plant. Native of the East-Indies; Requires to be kept in the stove. Flowers in September and October.’ [BM t.1911/1817]. 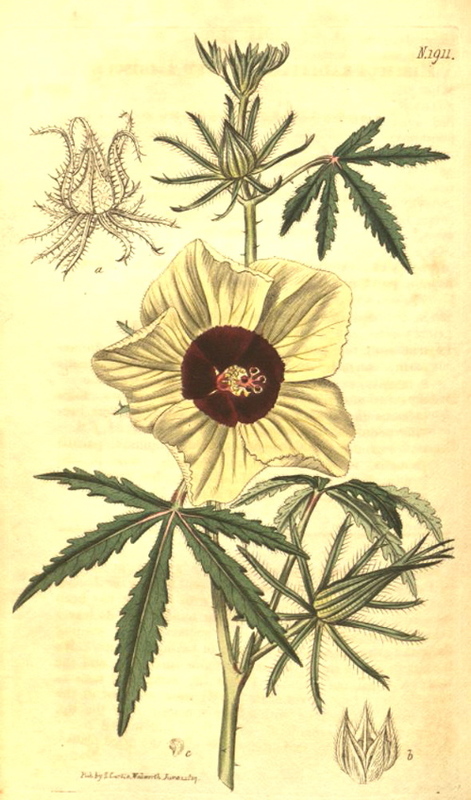 ‘[Hibiscus cannabinus] is cultivated in the East-Indies, both as a pot-herb and for the manufacture of a coarse kind of hemp; the leaves having a pleasant acid taste, not unlike sorrel, and the stalks containing a fibrous substance, capable of being made into cordage, but which is neither so strong nor so durable as that made from hemp. It has been probably owing to the circumstance of its being applied to the same purpose and of the similarity of its foliage with that of the hemp, that it has by some authors been mistaken for the plant producing the Bang, an intoxicating substance made use of in the East, the principal ingredient of which appears to be a species of hemp.’ [BM t.1911/1817]. ‘[Hibiscus Lindlei] is, like most of the genus, a shewy and beautiful flowering plant. It is a native of the Burma Empire, and has been named by Dr. Wallich after Professor Lindley.’ [LBC no.1849/1834]. According to Paxton's Magazine of Botany, Hibiscus lindleyi was introduced by Dr. Wallich to the Horticultural Society gardens in 1828 [MB p.77/1834]. BR f.1395/1832. Listed in the 1850 and 1857 catalogues [T.542/1850]. Hibiscus cannabinus is an important economic crop, yielding the fibre hemp. Hibiscus cannabinus L. | BM t.1911/1817 | BHL. The variety lindleyi has purple flowers. Hibiscus radiatus Sieber ex Steud.